What about donations that are given by people for a specific purpose? Do you want to change something? 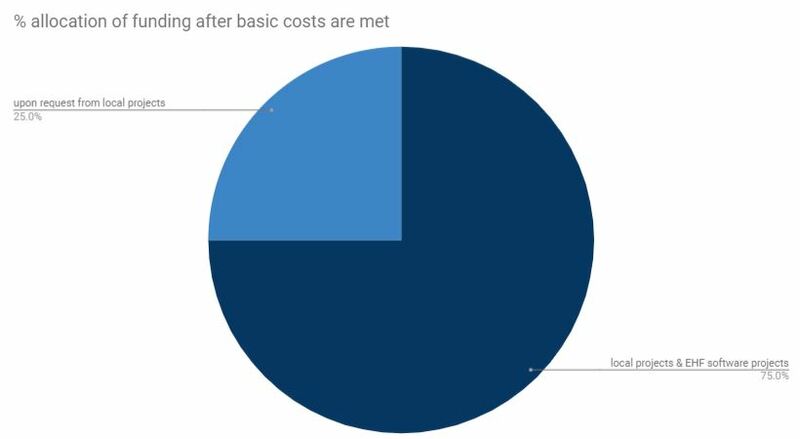 Basic costs are top priority - this means that our server and domain costs are satisfied first. We aim that these should be not more than 25% of donations or not more than 165 Eur per annum. Basic costs include all costs that are necessary for the project to run, at the moment this includes the costs of running a server and the domain. These costs should be not more than 165 Eur per year and we should aim for this to be around 25% of the donations Eco Hacker Farm receives. The time spent by volunteers as individuals or as part of the local projects in the first instant is considered as voluntary and is therefore not remunerated. In special cases and subject to approval, Eco Hacker Farm may allocate funding to the local projects to cover to a reasonable amount the amount of hours dedicated to Eco Hacker Farm tickets. More info on this here. The allocation should be split between the local projects and the software projects equally unless any one of these decide they are not in need of financial assistance and would like to relinquish their share to others who may need it more. In order for local projects to access their share of funds they need to maintain detailed accounts including copies of receipts. Eco Hacker Farm reserves the right to request proof of these before releasing the funds to the local project. Funds can used by the local project in line with our ideals. Funding allocation and transfer of funds will be documented on the EHF accounts. In order for EHF software projects to access their share of funds they need to maintain detailed accounts including copies of receipts. Eco Hacker Farm reserves the right to request proof of these before releasing the funds to the software project. Funds can used by the software project in line with our ideals. The EHF software projects may decide to allocate a portion or all the funds towards local projects when said local projects work on the EHF software projects. This would be limited to a reasonable amount that would cover basic costs. For example the day rate for Kuckucksmuehle is at the time of writing 13 Eur per day which would be equivalent to 5 hours of work. The allocation amount must not exceed this figure per day and is subject to approval and funding. Local projects may request additional funding over and above the 37.5%. These can be for services rendered to Eco Hacker Farm work or other costs. These could include emergency costs to the project such as repair work or special one time projects, recurring basic costs etc. When the person making a donation specifies what the donation is for we will honor the donors wishes and allocate the funding directly to the purpose that they desire. Did you read something here that you would like to change? Then please contact us, we are happy to discuss this further and reconsider our decisions where appropriate.